1. To make the vinaigrette, place 2 granny smith apples, cider vinegar, brown sugar and mustard in a small saucepan and cook until soft. Puree with olive oil and season with salt and pepper. 1. 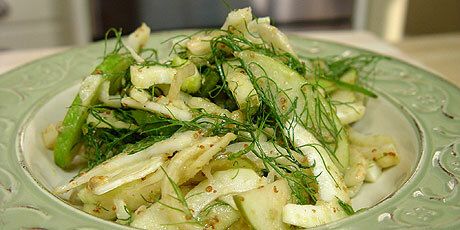 Put the sliced fennel, fennel fronds and sliced granny smith apple in a large salad bowl and toss with a few spoonfuls of the warm apple vinaigrette.